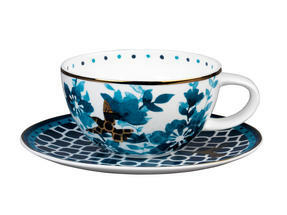 From Portobello by Inspire, this gorgeous cup and saucer set provides a more opulent way to enjoy a cup of tea. With elegant features and a blue watercolour style design, this exquisite set will look charming in any setting. Crafted from bone china with a smooth gloss finish, the cup and saucer are both microwave and dishwasher safe, making them practical and convenient to clean. Ideal for special occasions or simply for everyday use, this beautiful set will look wonderful in any home. This Portobello cup and saucer set is made from high quality bone china with a gloss finish which is perfect for everyday use. They are dishwasher safe so you can enjoy a cup of tea then pop the cup and saucer straight into the dishwasher with no fuss or hassle. Also suitable for use in the microwave, you can easily warm a relaxing drink of milk or prepare an indulgent hot cocoa in the evening. The cup measures 6h x 11.5w cm and holds 300ml, or 350ml if filled to the brim, while the saucer measures 17.5 cm in diameter. 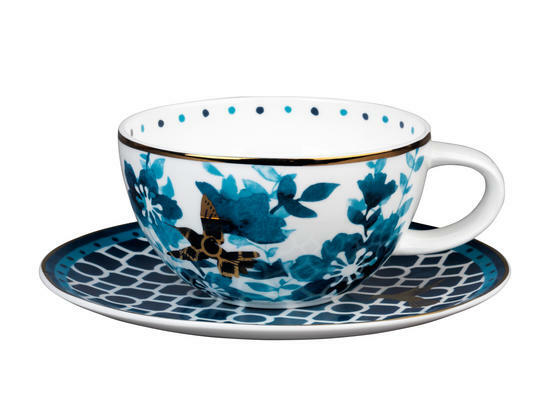 Beautifully elegant, this delightful cup and saucer set is guaranteed to impress so you can enjoy a peaceful break wherever you are.